Brief History: From 1959 through 1962 contractors of the US Army dumped a large number of barrels into Lake Superior. The barrel dump sites have been identified by the Minnesota Pollution Control Agency (MPCA) as site number MND980679344. The items, considered classified, were manufactured by Honeywell under a DoD contract. It was reported that the barrels of the classified grenade parts were dumped into Lake Superior because at the time (1960s era) it was considered the most economical and secure disposal method available. Range / Site Description: From 1959 through 1962, in excess of 1400 barrels were dumped into Lake Superior under the supervision of the US Army. Six loads of barrels were dumped on 7 days from 1959 to 1962. The barrels contained material used by Honeywell, Inc. at the Twin Cities Army Ammunitions Plant (TCAAP). In addition, 6 barrels were determined to have come from the Honeywell facility in Hopkins, MN (US Army Armament Material Readiness Command 1977). Other than the 6 barrels from Honeywell, Hopkins, there is no indication that the contents of any group of barrels was different from any other group of barrels. In 1968, a local fisherman, Mr. Stanley Severson, operating the vessel Hiawatha, reportedly netted several barrels while trawling in an area approximately 7 miles N.E. of Duluth, Minnesota. Newspaper accounts and letters written to the St. Paul District by the Save Lake Superior Association several years later relate that the crew found a barrel weighing approximately 700 pounds containing metal parts, resembling buckshot. The barrels were reportedly inspected onboard the Hiawatha and dumped back into the lake in shallower water in the same general area. 1976 - In December 1976 about 20 barrels were located during a magnetometer search by a researcher from the University of Minnesota. 1977 - Attempts to find barrels in 1977 were unsuccessful. 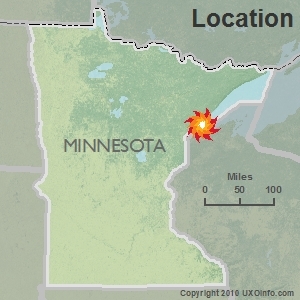 Searches included a joint effort by the Army and the University of Minnesota researcher to relocate barrels identified in the 1976 magnetometer search. An underwater camera search of the area was not successful in locating barrels. 1990 - The US ACE located numerous barrels at the Talmadge area dump site in 1990. Two barrels were retrieved during recovery operations in 1990. The barrels contained parts resembling gears, springs, timers and scrap metals consistent with grenade parts. 1993 - Between September 9 and 20, 1993 a side-scan sonar search of additional areas was conducted under contract from the USACE. Five barrel disposal sites were identified. Three were verified by underwater video. 415 targets were identified by sonar, of which 249 were considered to have a high probability of being barrels. 1994 - Recovery operations were resumed in 1994 and 7 barrels were recovered from 3 different locations. Activities Completed: In 1977, the USACE conducted a archives investigation into the contents of the barrels. The records search indicated that the majority of the munitions debris in the barrels were the top and base section assemblies for the M32 Grenade and the succeeding family of grenades - notably the M40. A Health Consultation was conducted by the U.S. Department of Health and Human Services in 2008. Issues: MDH plans no additional action related to this site. MDH will review new information on this site if there is additional investigation. Searching tug boat records and internal Department of Defense, TCAAP and Honeywell documents to assure that all available information about the dumped barrels has been acquired. Locate and record exact location and condition of as many barrels as possible. Record observations on corrosion and holes in each barrel and sedimentation around each barrel. Focus any risk analysis on the potential risks to aquatic species. These communities are more likely to be impacted than people. If risks to aquatic species are significant, subsequent analyses can be performed to identify potential risks to people. Further assurances that contamination from the lake does not impact public water supplies could be accomplished by conducting underwater video or photographic surveys of the area around the water intakes (e.g. within a couple thousand feet). Chemical analyses of water or sediment samples in this area is not recommended, unless there is some indication that there is a significant source of contamination in the area.